Do you remember what your skin felt like during your childhood? Or better yet, have you touched a baby’s skin recently? These types of skin are so smooth and pure that they look beautiful. Why? When we are younger, our skin has elasticity and moisture in it which helps to keep us glowing. The trouble is that as we age, we lose collagen, moisture and elasticity, and we begin to see fine lines and wrinkles, crows feet and laugh lines. This is one reason why Herbalix created the Supreme Solution Intensive Body Moisturizers. What’s more, the environment we live in today contributes to premature aging and damages our skin. Between harmful toxins, UV rays, and dirty air and water, plus all the bad chemicals and pesticides in the foods we eat — it all takes a terrible toll on the skin we live in! The good news is that organic skin care products can revitalize the outside. And, just like your grandmother used to say, fruits and vegetables have also been shown to help fight cancer causing properties. These same fruits and vegetables are used in organic skin care products such as apples, papaya, or cucumbers which are commonly used organic fruits used in organic skin care products. These ingredients are not only refreshing but invigorating for the skin. Milk has also proven to have effective cleansing properties, as well as being soothing for dry or sensitive skin. Choosing an organic skin care line provides the same advantages of organic foods – offering effective treatments for skin, hair and body that work in harmony with your skin’s natural functions to keep you looking healthy and radiant. Organic skin care products can be used at any age to slow or minimize the signs of aging. In your 30s, you may notice the beginning signs of environmental damage. During your 40s, skin’s collagen and elastin network begins to break down. As a result, wrinkles begin to appear around the eyes and around your nose and mouth. Facial skin becomes thinner as you age, and it loses water and oil. It also can become uneven in texture and color. Skin at this stage needs extra nourishment and support. There are many organic skin care products from Herbalix Restoratives. Organic skin care products help return your skin to a more natural, youthful state. Nature has powerful weapons to fight aging, and Herbalix has harnessed them. In a new research study from Researcher MV Heisterberg, there are indications that it is the fragrances in deodorants frequently causing contact dermatitis allergy, while cosmetic products are the main causes of fragrance contact allergy. It was after a study was done comparing deodorants and fragrance mixes they contained, when Heisterberg and colleagues determined that deodorants were the leading causes of fragrance allergy, especially among men. The good news is that fragrance is not required for the function of deodorant. There are many fragrance free deodorants on the market — including Herbalix Restoratives’ Using a fragrance-free deodorant will help prevent contact dermatitis, allergies, and asthma from fragrance ingredients. Additionally, there is also aluminum in most commercial deodorants, and a percentage of people are also allergic to aluminum and may experience contact dermatitis when exposed to aluminum containing deodorants. Non-aluminum deodorant and antiperspirant is more safe. A temporary plug within the sweat duct is formed whenever aluminum-based compounds are used as active ingredients in antiperspirants form that stops the flow of sweat to the skin’s surface. Some research suggests that these aluminum-based compounds, which are applied frequently and left on the skin near the breast, may be absorbed by the skin and cause estrogen-like (hormonal) effects. 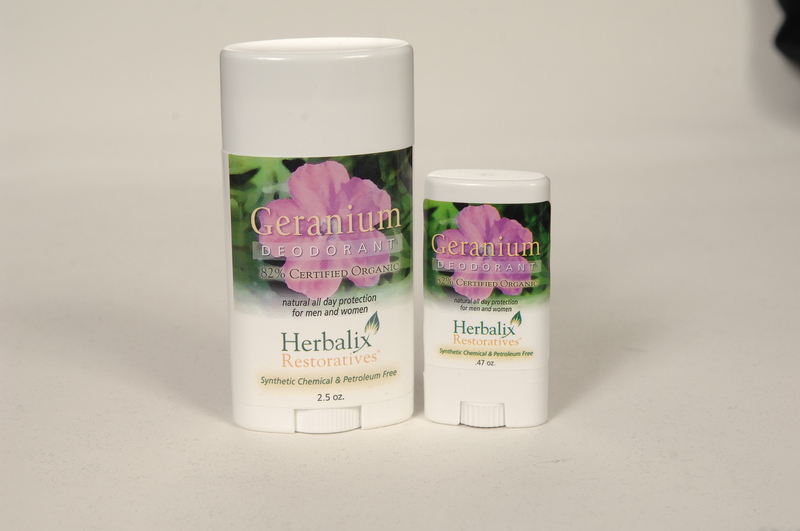 As aluminum-based compounds in antiperspirants may contribute to the development of breast cancer, you should consider using an aluminum-free deodorant, such as the Herbalix Detox Deodorant to remove build-up in the tissue. The California Organic Products Act of 2003 (COPA 2003), for example, doesn’t allow the retail sale of any cosmetic product labeled organic unless it has a minimum of 70 percent organic content. And that is EXCLUDING WATER OR FANCY NAMES FOR WATER and extracts. If a product has been labeled organic but does not meet these COPA requirements, then it cannot be sold in the State of California legally. In order to see if a product is safe to use, go to The Campaign for Safe Cosmetics – which is an effort launched to protect the health of consumers. They are working to secure regulatory and legislative reforms to eliminate any of the unsafe chemicals from cosmetics and personal care products. There are also a number of brands claiming to be “certified by EcoCert” that do NOT meet the legal requirements for organic in the U.S. They must contain at least 95 percent NATURAL (not organic) ingredients. The organization was created in 2002 by ten cosmetic laboratories working on job specifications for cosmetics companies. Products that bear the organic or environment friendly logo contain mainly natural ingredients. What’s more, the natural ingredient must be naturally derived or come from renewable resources such as plants; they must not be tested on animals and they must be packaged using recycled materials. According to the Natural Products Association (NPA), an organization that advocates on behalf of consumers, retailers, and suppliers of natural products, if you are part of the natural products industry, consumers need to be educated to maximize their own health and well-being. The association has developed the Natural Products Association Standard and Certification for Personal Care Products, which is basically a set of guidelines that dictate whether a product can be deemed truly “natural.” The NPA natural standard is based on natural ingredients, safety, sustainability and responsibility. •	Natural Ingredients – meaning a product labeled “natural” should be made up of only, or almost only, natural ingredients and be manufactured with appropriate processes to maintain the purity of the ingredients. •	Safety – a product labeled “natural” should avoid any ingredient with a suspected human health risks. •	No animal testing – A product labeled “natural” should use no animal testing in its development. •	Sustainability – A product labeled “natural” should include or use biodegradable ingredients as well as only environmentally sensitive packaging. These “allowed ingredients” must be made from a renewable resource found in nature (flora, fauna, mineral), with no petroleum compounds. •	Generally Recognized as Safe (GRAS) — when used in accordance with the Food and Drug Administration (FDA) good manufacturing practices (GMP) and contain no residues of heavy metals or other contaminants in excess of tolerances set by FDA or EPA or has been reviewed using criteria in this Standard. Standards help consumers become more educated about processes as well as the ingredients that are considered natural, versus organic, giving them the information needed to easily identify which personal care products meet the standard for natural, and make the best decisions when choosing skin care products including organic deodorants. These types of standards help consumers become more educated about processes as well as the ingredients that are considered natural, versus organic. This gives them the information they need to easily identify which personal care products meet the standards for natural. Then they can make the best decisions when choosing skin care products including natural organic deodorants.